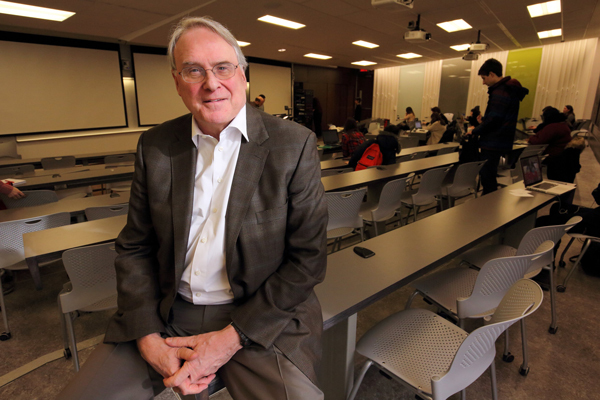 Hockey legend and politician Ken Dryden thinks big. Last year, he worked with Teaching and Learning Services to help University of Calgary students join his “Future of Canada” course through videoconferencing. This year, McGill and U of C students are joined by virtual classmates from Memorial, Ryerson and the University of Saskatchewan. Ken Dryden doesn’t do half-measures. Why win one Stanley Cup when you can win six? Why rest on your Hockey Hall of Fame laurels when you could reinvent yourself as a politician and teacher? And why teach a course on the future of Canada only to McGill students when you could bring students from four other universities into the discussion — at the same time? Dryden first taught “Making the Future,” a course offered by the McGill Institute for the Study of Canada, in Winter 2012. For two years, it was a traditional course: held at McGill, for McGill students. Last year, he collaborated with Teaching and Learning Services to simultaneously teach the course to students at McGill and the University of Calgary. This year, Dryden and TLS are using updated videoconferencing technology (a system called BlueJeans) and learning technologies such as polling and online discussions to further expand their virtual classroom to include students from Memorial University in St. John’s, Ryerson University in Toronto and the University of Saskatchewan in Saskatoon. Co-teaching at two universities isn’t uncommon, but this project is particularly ambitious. Each Thursday, 140 students across four time zones gather at their respective universities to collectively explore a different aspect of the Canadian experience — such as family, diversity, religion, work, politics, health care, public engagement — with a focus on how things got to be where they are today, and where they’re going. Guest speakers, who could be in any of the five classrooms, share their expertise. Then the discussion starts. The course is an experiment in engagement, says Dryden. It’s an exploration of how communication technology can “create the illusion that everybody’s in the same class.” Sixty-four McGill students meet in the newly renovated Arts W-120, which features microphones for each student and multiple cameras; their cross-Canada classmates convene in similarly equipped rooms. Dryden is surprised by how the overall class maintains the high level of student engagement one would expect from one of these relatively small rooms — even though the collective virtual classroom is much larger. “If you were in a class of 140, you wouldn’t imagine much interaction,” he says. “You’d have the same eight people who are involved each time. Well, that isn’t necessarily how it feels when you’re in this. So our expectation and their expectation is to try to make it feel almost like you’re in one place at the same time. And the students really like that. The cross-Canada engagement doesn’t end when the lecture does, either. During the semester, each student has to write two short papers—and they have to do so in collaboration with a student from one of the other universities. The two students may have completely different views. They may have different abilities and interests. They may not get along, or even like each other. They are likely in different time zones. And they need to not only navigate those challenges and differences, but do so at a distance. For Ken Dryden, it’s the perfect preparation for being an engaged Canadian in the 21st century. Learn more about “Making the Future” here.